If quality, serenity and total luxury are what you’re seeking in your next holiday to Corfu, then our Corfu luxury villas offer world-class accommodation for the discerning traveller. 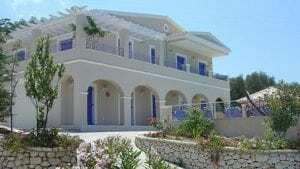 Featuring all the modern conveniences you’d expect from a luxury Corfu Villa, all of our Kassiopi properties also enjoy stylish, handpicked modern furniture, spacious, airy living areas and ample bedrooms for that special occasion or family getaway. Enjoy the golden glow as the sun sinks below the glistening Ionian Sea on the beautifully spacious sun terrace or enjoy the rugged beauty of the mountain vistas as you arise to the chorus of nearby birds, our villas possess both stunning seascapes and breath-taking scenery at every turn. Set in acres of lush private gardens, enjoy the tranquillity of your own large pool with far reaching ocean views while you soak up the serenity and sun in complete privacy. For an extra indulgent stay, we can also arrange a private chef to tempt you with the freshest local produce and local dishes and full maid service, so you can concentrate on total rest and relaxation in this elegant and unique setting. If you can bear to tear yourself away from the views of the sparkling Mediterranean Sea and soft, white beaches, our villas are close to all local amenities whilst being a perfectly secluded retreat away from the hustle and bustle.